Whether you're looking to get published or just hoping to hook your reader, first impressions are vital. Compelling opening scenes are the key to catching an agent or editor's attention, and are crucial for keeping your reader engaged. This helpful guide walks you through the tasks your first 50 pages must accomplish in order to avoid leaving readers disoriented, frustrated, or bored. Don't let your reader put your book down before ever seeing its beauty. 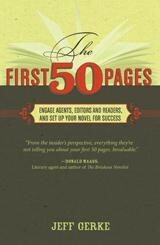 Let The First 50 Pages show you how to begin your novel with the skill and intentionality that will land you a book deal, and keep readers' eyes glued to the page.